Tag Archives: Stop You’re Killing Me! Publication Data: First edition 1940, Doubleday Doran of New York under its Crime Club imprint. First paper Popular Library #7, 1943, with a cover by H. Lawrence Hoffman. According to Stop, You’re Killing Me! 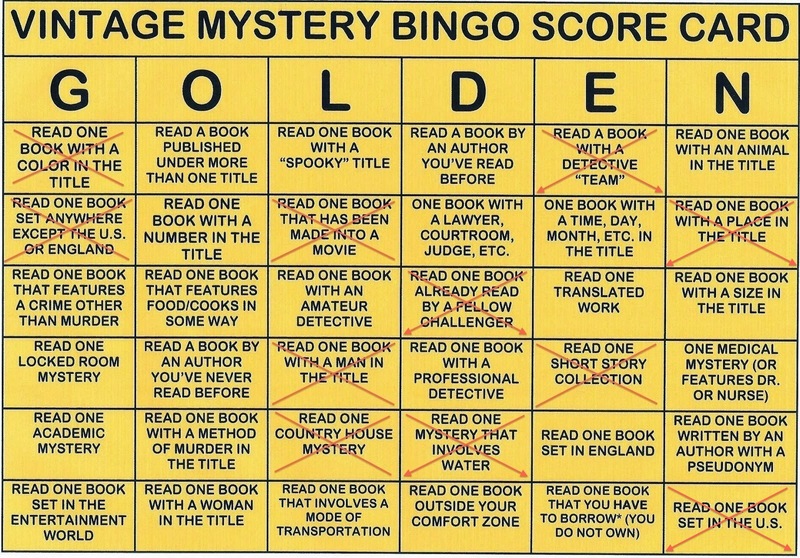 (an excellent and useful resource that gives chronological lists of mystery writers’ books for people with my kind of OCD who are too lazy to walk across the room and plough through Hubin) this is Reilly’s tenth Inspector McKee novel. The “cheap edition” in hardcover was Sun Dial, 1940. A couple of paperback editions exist and they are significantly ugly LOL, which somehow makes them more collectible. Someone on the Internet is today offering a Bantam edition which I’m fairly sure doesn’t exist, and Mike Grost of MysteryFile agrees with me (and he knows more than I do about nearly everything); other than the Popular Library first paper, I’m only aware of Macfadden (1967) and Manor (1974) editions. I used the Macfadden edition (#60-473) to prepare this post and so, as is my habit, I used it at the head of this article. The reader should be aware that there are no ghosts or graveyards in the book and I have no idea what the cover is intended to represent. Standard spoiler warning: What you are about to read might discuss in explicit terms the solution to this murder mystery and will certainly give away large chunks of information about its plot and characters. Please read no further if you wish to preserve your ignorance of its details. You will also probably find here discussions of the content of other murder mysteries, perhaps by other authors, and a similar warning should apply. The action begins at a department store in New York at 47th and Fifth (today, I believe, known as the Diamond District, although I remember the area as the home of the much-missed Gotham Book Mart). Early in a January evening, a small crowd is waiting outside a display window for Garth and Campbell to raise their latest display window into position. When it rises from the depths of the basement, the window contains a mannequin of a beautiful girl and also contains a man’s corpse. A passing police officer, Todhunter, attached to Inspector McKee’s homicide squad, notices that a young woman in the audience bears a striking resemblance to the mannequin. She sees someone, has a strong emotional reaction, and decides to leave in a hurry; Todhunter follows her for the next hour, apparently convinced that she has something to do with the murder. The corpse is a window designer named Franklin Borrow, and the vanishing young mannequin-lookalike is Judith Barrow, who will later attest that her father told her that if anything happened to him, she should hightail it to his home and get the contents of a mysterious green dispatch box. Todhunter follows her home and both are bopped unconscious by someone who apparently wanted the contents of the box, which is now missing, and got there first. Meanwhile, Inspector McKee is investigating the staff and working environment of Garth and Campbell. He soon learns that the victim had an appointment with Luke Cambridge later that day; Luke had sent his brother Gregory to drive to the store to pick him up, since the Cambridge estate is hard to find. Not only Gregory, but his wife Irene, and their daughter Ellen (soon to be married to young Toby Newell) were all in the neighbourhood of Garth and Campbell near the time of the murder. Luke claims to have never met the victim, or to know what was on his mind. Subsequently, however, Luke invites Judith Barrow over for a chat; before he can reveal what, if anything, is on his mind, he’s murdered. There is much further investigation and another murder attempt (someone tries to set fire to the hotel where both McKee and Judith Borrow are staying). McKee and his staff learn that there is a long-ago connection between Luke Cambridge and Franklin Borrow, who were both at a Colorado hotel in 1912. 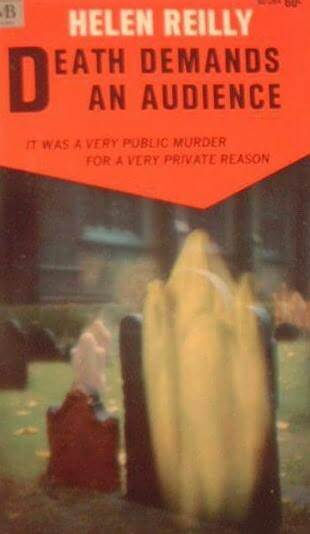 A creepy subordinate of Borrow employed at Garth and Campbell is murdered. Eventually, McKee realizes the nature of the connection between Cambridge and Borrow, and a crucial relationship (which is both completely secret and highly shocking) that underlies all the subsequent criminal events is finally revealed, which solves all the murders. Why is this book worth your time? Recently in this blog I published an essay about the origins of the police procedural, found here, which collected further comment from some very well-read individuals who had read both this post and an earlier one on the end of the Golden Age of Detective Fiction, found here, where this inquiry into the police procedural began. 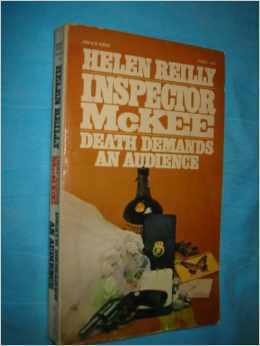 I foolishly asseverated that the origin of the police procedural was considered to be Last Seen Wearing by Hillary Waugh, from 1952; many of my commenters disagreed and pointed me at, among other things, the Inspector McKee novels of Helen Reilly. So when I happened across a copy of this volume in my library, I thought it would be worth my time to re-read it and comment with the police procedural form in mind. 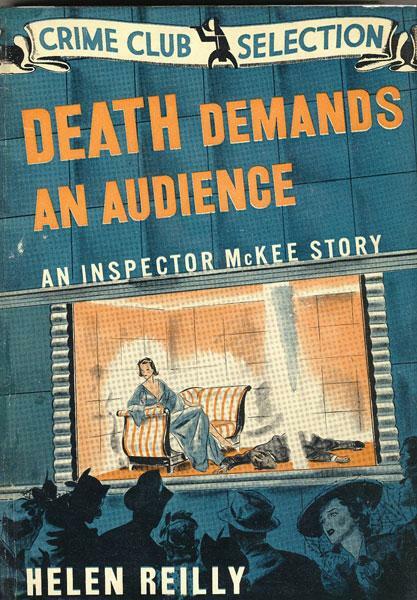 As best I can tell, people who assign the McKee novels to the police procedural category are impressed by Reilly’s story structure, where the investigation of the murders at the heart of the plot is carried out not by McKee alone, but by a group of police officers under his command, one of whom is the long-suffering Todhunter. I agree that this brings them exceptionally close to the procedural form (the term “police procedural” would not be invented for a number of years). To me they don’t “feel” like procedurals; let’s say I’m dubious. The other police officers don’t seem to me to have individual personalities (neither, really, does McKee) — this is not the 87th Precinct, to be sure. I have had it suggested that this series places a reliance upon showing the interaction between police officers and scientific investigators. Well, that may well be true in other volumes; I didn’t notice it particularly in this one. I’m willing to be polite and say they remind me of police procedurals … what they really make me think of is “detective stories” based around the work of a single detective, McKee, directing the work of his subordinates but solving the crime with the effort of his own mind. Kind of like Freeman Wills Crofts’s Inspector French. And, as I said, with a healthy helping of the point of view and stylistic touches of what I call the brownstone mystery. Men reading this novel (at least upon its first publication, I suggest) would miss or skim over quite a bit of material that is there to interest women readers. Like the works of Frances Crane, to my mind another brownstone practitioner, there’s an awful lot of information about clothes here. It starts with the mannequin in the window cradling the corpse. “Trailing draperies of sea-green chiffon, yards and yards of it, set off the slender long-limbed figure … One white hand, on which a magnificent star sapphire flashed, emerged from ruffles of duchesse point …” (Although why she’s wearing a blue ring with sea-green chiffon is beyond me.) And then a paragraph later, a line that made me chuckle. “Someone else said, ‘My dear — what a negligee! Look at those lines. '” Are you impelled to look up the definition of duchesse point? Try Wikipedia, here; it’s a kind of Brussels lace. I was forced back to reference materials during the extended description of Ellen Cambridge’s wedding dress, to define moyen-âge. Apparently the wedding dress has a kind of “Middle Ages” look about it. Similar attention to clothing abounds. When we learn from a department store salesperson that one of the suspects was shopping for blouses close to the time of the first murder, we also learn that she wants them for a southern climate (what we today call “resort season”, I believe) and we get a brief description of what she liked, and even what it would have meant to the salesgirl to sell them to her. “Pimpernel”, incidentally, seems to be a shade of scarlet. And since Ellen is described by a vendeuse as a little bit wide through the hips, I’m going to suggest that a size sixteen might be appropriate, but it seems very large to my 2014 sensibility in a day when at least one of my female friends wears a size zero. Apparently young brides weren’t slimming down in 1940 to get into their moyen-âge wedding gowns. The point is, though, that the reader is meant to know that Ellen wears a size 16, that she intends to go south on her imminent honeymoon, and that she can afford to buy five garments without worrying about the cost, which I think would not have been the case for most of Reilly’s female readers. (Ellen was her wealthy uncle’s favourite and expected to inherit his wealth.) The fact that Ellen wears gloves on a shopping trip is not unusual for 1940, but it certainly would be for 2014. Overall, there is a lot of information about what women are wearing; note that Reilly is sure that her audience knows what the classics are for resort wear without explaining them. I really do think that this book was written for a female audience for more reasons than the clothes, though. Quite a bit of that suspicion is based on a central romantic relationship of the novel. I’ve chosen not to be precise about it here, but I found it rather shocking for 1940. And I went back and looked at the initial description of one of the participants in that romantic relationship as that person is introduced. I truly believe that a woman would get something different from the description than a man, as it occurred to me upon re-reading; quite a bit from the description of clothing that is indicative of personality. It’s hard to say anything further without spoiling the surprise, but if and when you read this novel, go back and look at the characters’ introductory moments and try to imagine what you are being told about their personalities from their clothing — and by whom you are being misled. The revelation of this romantic relationship, by the way, was a complete surprise to me, and that’s not a good thing. There was no sense that any kind of romantic relationship existed that would underlie or motivate some of the events in the book; there doesn’t seem to be any natural affinity between the two characters that is displayed in any way, and really I think it’s just been made-up in order to make some of the actions of the book more believable. There’s another curious point to this novel where I’m not on as firm ground; the geography. Certainly in the opening chapters of the book you can follow the progress of some of the characters on very specific subway lines, and I attest that they do go where they are said to go. Less solid is the geography of the homes of the extended Cambridge family; as near as I can tell, it’s meant to be a kind of pocket that hasn’t yet been developed, but that today must be completely swallowed by urbanity. We see the house clearly, and the neighbourhood is sketched in. But Reilly goes into a great deal of detail about who goes where and precisely how they get there … to me, this is a more “masculine” style. I’m not solid on this idea, but I thought I’d put it out there to see if anyone else had noticed that Reilly goes into this kind of detail in other books. I’m sorry to say that there’s a big logical hole in the plot, at least from my point of view. The book is full of police officers who can come up with information about who was where at what time (for instance, Miss Eberhardt at the blouse counter testifies about Ellen’s whereabouts and activities; another character is trailed on a path through three banks and his loan applications are immediately revealed). But at the very beginning of the novel, when we are shocked by the corpse in the display window, we are also told that Judith Barrow recognizes the body of her father and immediately takes off for his house in a taxi in order to get hold of the green dispatch box — followed by Todhunter. They take public transportation to the Bronx (Van Cortlandt Park Station) whereupon they transfer to taxicabs. And there’s a line that piqued my attention: “Intent on the chase, Todhunter didn’t notice the third cab creeping along in the rear.” (A classic HIBK phrase, by the way.) This would be the murderer, who is about to hit both Judith and Todhunter over the head when they arrive at the victim’s house and remove the box of documents. How did the murderer’s taxi get there first? Why doesn’t Todhunter notice the murderer’s footprints in the snow? And even after these events, why do the police completely ignore the possibility that the murderer took a taxi and try to trace people’s movements? Nobody seemingly goes out questioning dog-walkers and neighbours for someone who’s seen a person carrying a green dispatch case, although that seems to be something that would be remembered. And I can’t think of why the murderer didn’t merely remove the contents of the box without taking the box away; we learn later that it’s been opened with the key, so the murderer takes the chance that someone will notice the box as it’s being carried away and it’s entirely unnecessary. Of course, if the police had paid attention to this part of the case, the book would possibly have ended about page 75, so I can see that that’s a blind spot that’s necessary to the story. (And honestly, there is no real reason for Todhunter to take off after Judith Barrow when there is a fresh corpse sitting in front of his eyes that could use his professional attention.) Really what it makes me think is that Reilly came up with the story hook of the body in the display window rising out of the floor and then had to deform the logical activities of the murderer, police, and other characters in order to make it work. And that’s a little unfair. All things considered, though, I did enjoy this novel; perhaps not for the reason that it’s a difficult puzzle-mystery. In fact it’s not really possible to solve this mystery upon first reading unless you make a huge logical leap and infer a romantic relationship between two characters who have not given you any reason to think they are involved. And as I’ve said, the murderer is pretty much the Least Likely Suspect; I don’t mind that, I just don’t think it’s a very interesting way to end the book without giving much in the way of a hint that the murderer is the kind of person who might do these things. But I liked the writing. I liked the accretion of detail so that it became difficult to separate actual clues from mere background. I liked the characterization where there was any, particularly of the icy Judith Borrow. And I particularly liked the details of everyday life in the New York of 1940, with all the masses of information about what women were wearing. I don’t really mind that the book is a hybrid of a proto-procedural and a “brownstone”; I like both those genres. I liked the inexorability of the plot; one really does feel that McKee and his large staff of minions will succeed no matter what. And I would certainly like to go back and read the remainder of the series, so Reilly has enough skill to hook me. And if you’re relatively uncritical (and especially if you’re interested in women’s clothes) you will enjoy this novel too, I think. As of today, a Pennsylvania bookseller wants $525 (plus $45 shipping!) for a VG first edition in a repaired dust jacket, and a Californian dealer wants $250 for a VG+ first in VG+ jacket. But a Texan bookseller wants a mere $30 for a VG first in a Good+ jacket. Even making allowances for the difference in states, at least one of these prices has to be somehow wonky. I think the Californian is closest to reality at $250. 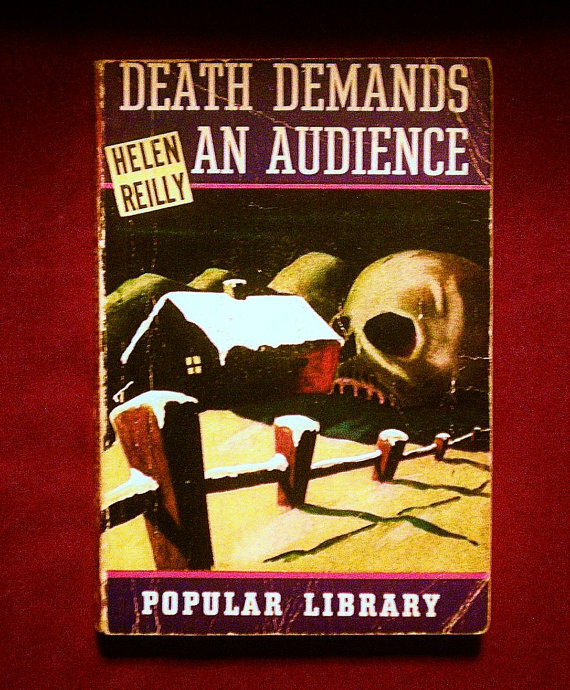 But my candidate for most interesting copy of this book is Popular Library #7, from 1943, pictured here (the skull behind a little house behind a long row of fenceposts). I see a copy available for $17 plus shipping and that seems about right for this very early number from a significant paperback publisher. I wish I could have seen the cover in 1943 when the ink was fresh and bright; all PL titles of this vintage have washed out to some extent and the few copies I’ve seen of this particular title have not held up well. My own volume is a beaten-up reading copy that looks like it went through a lot of hands, and it might be worth $5 as a placeholder in a Popular Library collection. The first edition seems to be the only jacket that actually shows a scene from the book (although the corpse is placed incorrectly). PL #7 shows a farmhouse that implies a rustic aspect to this book which is entirely lacking, and the ugly MacFadden Bartell paperback from 1969 that I used to write this appears to show a phosphorescent ghost in a graveyard — and makes a significant error about the contents of the novel on the back cover. “The third [victim] breathed his last in a crowd of people coming out of a theatre.” Well, um, no, that doesn’t happen in this book. I’m pretty sure it’s a different Helen Reilly novel, but the title is maddeningly escaping me. This 1940 volume qualifies as a Golden Age mystery; sixth under “N”, “Read one book set in the U.S.,” which in this book is New York City and its environs. For a chart outlining my progress, see the end of this post.